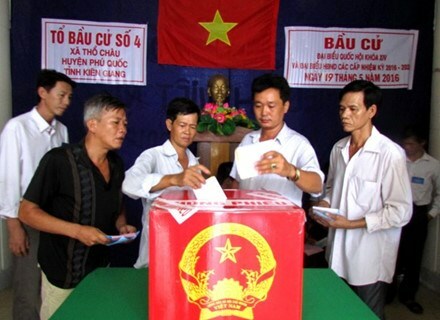 Kien Giang (VNA) – Voters in Tho Chau island commune, Phu Quoc district in southern Kien Giang province, on May 19 casted their ballots to elect deputies for the 14th National Assembly and People's Council at all levels for the 2016-2021 term. This is the only island commune of Kien Giang that has casted ballots three days earlier than the day of the elections nationwide. The island commune has 1,650 voters. From 6am, many voters gathered at polling stations to attend a flag-saluting ceremony and then cast their votes. Beyond the dock, fishermen operating in the Tho Chau maritime area returned to the island to go to the poll. Some soldiers garrisoning in the Tho Chau commune who went to the poll for the first time said they feel honoured to join the voting, expressing their hope that elected deputies will make contributions to the national defence and construction. Chairman of the Tho Chau communal People’s Committee Do Van Dung said the local Election Committee created possible favourable conditions for all locals to perform their citizen right and duty. Located approximately 120km from Phu Quoc Island district and 210km southwest of the mainland, Tho Chau comprises eight small islands, with Tho Chu being the biggest island. The island commune contributes significantly to national defence and security.